Strange Boat was written by Mike Scott and Anthony Thistlethwaite and first released on The Waterboys album Fisherman’s Blues, which was recorded in Spiddal over twenty years ago. In July 2007, this wonderful new version was again recorded mainly in Spiddal, at Cuan Studios, the studio where Éamonn had worked as a sound engineer right up to his death the previous Summer. You can listen to an excerpt from Strange Boat here (double click on the arrow). Order your copy directly by contacting us at info@strangeboat.org. 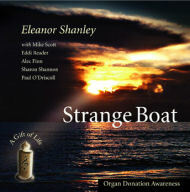 Once the idea of recording Strange Boat in Éamonn’s memory and for the purpose of organ donation awareness was suggested, the response from those involved in the recording was extraordinary. Eleanor Shanley, who helped initiate the project, Mike Scott, Sharon Shannon, Alec Finn, Eddi Reader and Paul O’Driscoll gave 100% to the recording, as did Charlie and Éilís Lennon, owners of the studio, and sound engineer, Tim Martin, a friend and colleague of Éamonn’s. The enthusiasm and generosity of spirit shown by all involved, and the unselfish giving of their time, talent and creativity was overwhelming. Sound Man Éamonn, the second track on the CD, was composed by Charlie Lennon and named in memory of Éamonn. This track is taken from Charlie’s album Turning the Tune, on the Cló Iar-Chonnachta label, an album on which Éamonn had worked as sound engineer in the months prior to his death. Strange Boat, CD/Single was initially sponsored by Hibernian Aviva Health and supported by The Daisy Label.